"Citrix VDI Box vs Parallels Remote Application Server"
VDI-in-a-Box is an easy-to-use VDI management solution for small and medium businesses alike, however, the framework is exceptionally limited in terms of functionality. For instance, users cannot scan and print from all type of devices, and administrators can only create guest image clones and cannot do any other managerial tasks related to the hypervisor. In addition, with VDI-in-a-Box, implementing some of the basic functionality included in a standard Parallels Remote Application Server installation requires the installation and configuration of additional components, some of which are third party and available at an additional cost. On the other hand, Parallels Remote Application Server is a complete VDI, desktop and application delivery solution that also allows organizations to manage users without the need to install and configure additional components. Why Parallels Remote Application Server? What are the Parallels Remote Application Server advantages? How VDI-in-a-Box differ from Parallels Remote Application Server in terms of VDI solution? VMware came into the business from a pure VDI solution, while Parallels Remote Application Server originated from RDS. VMware may be more appropriate for VDI clients; however, Parallels Remote Application Server will exceed expectations with RDS clients. While considering both VDI and RDS solutions, RDS is less expensive than VDI. As a VDI management tool, VMware Horizon View is exceptionally hard to set up, arrange, and utilize. Even though it is a dedicated VDI management solution, it has a number of shortcomings when compared to Parallels Remote Application Server VDI module. An out-of-the-box installation of VMware Horizon View is limited in functionality, requiring additional add-ons (some at an additional cost) to provide basic functionality. This paper explains how the features of Parallels Remote Application Server and VMware Horizon differ and how these differences affect the end user experience. 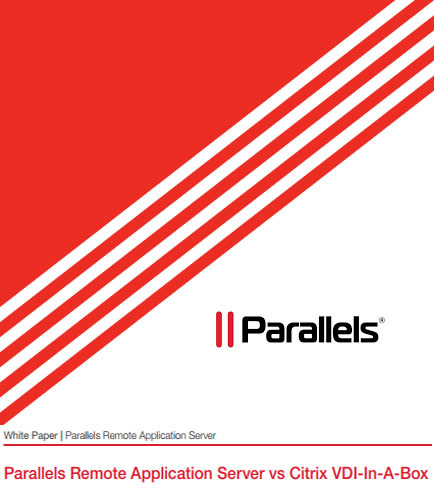 Move ahead and read the following whitepaper that will address all your questions, including these: How the installation processes for Parallels Remote Application Server differ from VMware Horizon? How to keep virtual desktops up to date? What are the unique VMware Horizon View features? Desktop virtualization and application publishing have made some amazing progress. There were just a few noteworthy players in the industry, but now there are quite a few different solutions that claim to do a lot of different things. When comparing Parallels Remote Application Server and Dell vWorkspace, one can't help but notice the ease of use and licensing options are significantly simpler. Parallels Remote Application Server allows organizations to remotely install all needed components when scaling up the infrastructure. With Dell vWorkspace, organizations need to manually install the agent on every new server added after the operating system is installed, and then they have to add it to the pool of their choice. This makes the Parallels Remote Application Server easier to set up and quicker to roll out. This paper concentrates on how the features of Parallels RAS and Dell vWorkspace differ and how these differences affect the end user experience. Move ahead and read the following whitepaper that will address all your questions, including these: How the features of Parallels RAS and Dell vWorkspace differ? How the differences between the Parallels RAS and Dell vWorkspace affect the end user experience? What makes Parallels Remote Application the clear choice for your business?